A Chinese woman carries her daughter across a busy intersection in Wuhan, June 11, 2012. Wuhan was blanketed by thick yellowish cloud that day, sparking rumors of an industrial accident that had released chemicals into the air. The provincial Environmental Protection Department, however, reported that burning straw was to blame for the poor air quality. Zhou Rong is a climate and energy campaigner at Greenpeace. Read this article at chinadialogue. On June 5, World Environment Day, China’s environment ministry published its annual “state of the environment” report as normal. But this year, the launch attracted unusual levels of attention thanks to a statement from vice minister Wu Xiaoqing on who should, and shouldn't, release air-pollution statistics. Any foreign embassy or consulate in China that monitors air quality and shares the results online contravenes both diplomatic conventions and China’s own laws, he told assembled journalists. Anyone who has followed China’s air-pollution saga in recent months will know which foreigners these words were directed at. The US embassy in Beijing became the focus of global attention last year after measuring and tweeting independent data (from a monitoring station on its roof) on the city’s levels of PM2.5, an air pollutant particularly aggravating to human health. At the end of 2011, the hourly tweets—in combination with a patch of particularly severe pollution—helped prompt a public furor and, later, changes to government monitoring rules. The authorities’ concerns about the reach of the US data are not unfounded. From a technical standpoint, it’s true that the embassy’s figures provide a distorted view of China’s overall air quality. But this does not detract from the key issue: air pollution is a real problem, and one which Chinese cities must face up to. In fact, you could say that unofficial pollution-monitoring schemes have come about precisely because the official system has failed to keep up with reality. The poor state of China’s air is not a subjective question about face-saving and external interference, but an undeniable fact which affects the lives of ordinary Chinese citizens. The top priority for Chinese officials must be to focus on solutions on-the-ground, and to speak to the people through their actions. The recent controversy stems from concerns about the reliability of the US data. Every hour, the US embassy publishes a figure for PM2.5 concentration, an air-quality index (AQI) value between 0 and 500 and a corresponding description—“good,” “unhealthy,” “hazardous,” and so on. These numbers and assessments, viewed by so many Chinese citizens, have helped to drive greater openness on the subject of air pollution in China. But they also raise questions. A close reading of the methodology approved by the United States Environmental Protection Agency shows that, even in America itself, a 24-hour average is used to calculate AQI values. But the data published by the US embassy in China is hourly and shows the fluctuations that occur throughout the day. An AQI calculated like this will distort the real air-quality situation and exaggerate an already serious issue. Put simply, if the average rating for a day is “unhealthy,” a rolling hourly feed will likely also include instances of “hazardous,” “very unhealthy,” and “unhealthy.” Air pollution fluctuates over the course of a single day: the peaks may be twice the average and the lows much lower. Publishing hourly data results in more “hazardous” and “very unhealthy” ratings, overstating the seriousness of the problem. When the US embassy started holding up its “magnifying glass” to China’s air-pollution problems, the continuous haze shrouding Beijing had already created a despondent public mood. 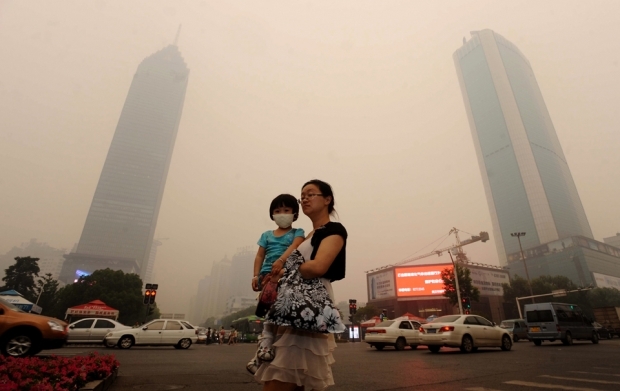 And yet the Chinese government was still issuing data proclaiming that air quality was good. Naturally, people started to question the official statistics and were drawn towards a data stream that, with its “hazardous” warnings, better reflected their own sense of the city around them. And so it’s quite clear that the way for the Chinese government to quell the doubting voices is to strengthen its own methods for sharing pollution data with the public. This needs to happen in two key ways. First, the government should face up to the severity of the air-pollution problem. China has long looked to traditional pollutant indicators like PM10 (coarse particulates) to evaluate air quality, but not PM2.5 levels. The result is a picture of air pollution that is, at times, too rosy—and out of step with public perceptions. Improvements are also needed in the way air-quality data is calculated. For many years, daily averages for pollution have been based on 11-hourly, rather than 24-hourly, samples. As pollution levels fluctuate over the course of a day, this gives local governments room to be selective about the data they use and share, producing statistics that need to be taken with a large pinch of salt. Second, although most Chinese cities have now started to publish PM2.5 figures—a major step forward—they remain evasive about the health implications of that data. The public don’t understand what a daily average PM2.5 figure of 35ug/m3 or 75ug/m3 means for their health. They just want to know if their elderly parents can go out for a stroll or their kids can go out to play, but the raw statistics they are given don’t tell them that. In the absence of more “human” data, it is hardly surprising that so many citizens, concerned about their families, turned to the US embassy’s feed and its depressing litany of warnings—exaggerations that have worsened the fear and mistrust of the government. It isn’t complicated stuff. But escalating it to a political—even a diplomatic—issue may just make it so. To regain public trust, all that the Chinese government needs to do is push its existing systems of data disclosure further, and provide accurate information in a format the public can digest and use. Breathing air under the same piece of sky every day, ordinary Chinese people make their own judgements about the state of their environment. And when it comes to statistics, urban residents will judge their veracity by their own experience. Zhou Rong is a climate and energy campaigner at Greenpeace.